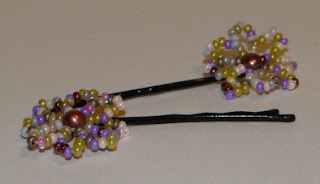 You can find instructions for these quick to stitch flower clips on Beadwork at BellaOnline. I made them last night while reminding myself that I really, really need to order reading glasses soon. I'm very near-sighted, and my current prescription is set up for distance. For close work and reading, I was given a weaker prescription. Why reading glasses and not bifocals? Because when I'm reading, beading or crafting, I'm doing it for hours at a time. Reading glasses are more convenient then bifocals for me. More later. I need to write it all a little more coherently then I did earlier.